I had barely woken up this morning, when my husband held a gift in his hand. It was a small black box that looked classy beyond anything. It even had a black bow tied to it. The minute I saw the color black, I new it had arrived. 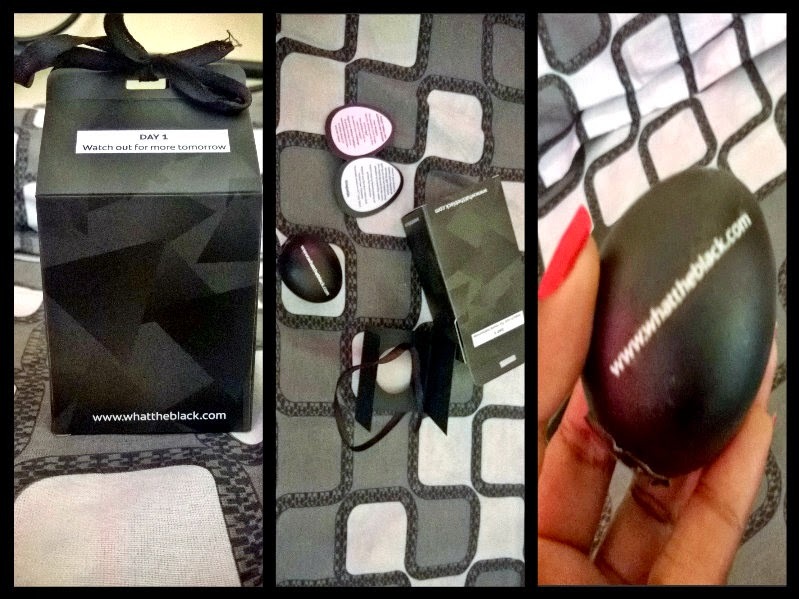 The surprise for the #WhatTheBlack activity from BlogAdda. The surprise arrived just like that, without an outer covering or an envelope with the address. That amazed me! The person just asked for me, and handed it to my husband and left. I looked at it closely. It had a sticker on it that said "Day 1, Watch out for more tomorrow". I rushed to wash my eyes and untied the bow! Well, a surprise it was. It was an egg! Completely black in color and heavier than a normal egg. My first instinct was chocolate! I licked it, but the black color left a trace on my tongue. Yeah, the color was fresh. This egg came with a note that said "The question is no longer 'Did the chicken come first or the egg?'. The questions now is 'Why is it black?'" I sat there for a good five minutes wondering what to do with it. Should I break it open? But then I decided against it, thinking that it will link to the coming surprises. As suggested, I placed it in a cool and dry place and left to work. It was on twitter that I got to know that it was indeed chocolate. Well, my guess was right then! So what could a solid egg shaped chocolate mean? Is it going to be a new brand of chocolate? Well, I have no answer yet! But I have a very good feeling about this. Let me see, what comes tomorrow! #WhatTheBlack is a four day activity in association with BlogAdda. Each day, the selected candidates will be receiving a clue and finally on the fourth day, the actual product will unveil itself. I received the egg too.. Yay!! Let's see what comes in tomorrow! Oh reply to that mail and raise an alarm. Now! The color is still fresh and I am yet to break it open. Lets see what comes tomorrow! Wow.. that is so cool! It sure was an awesome package. This sounds like so much fun!!!!!! Oh ho! It sure was fun!